For our money, one of the best lawn sprinklers is the Toveli Premium Lawn Sprinkler. It offers an adjustable water collar to direct water to the part of your lawn that needs it the most. You can change it easily to accommodate areas with different needs. And the controls let you set the irrigation area, the distance of the spray, and even adjust the spray pressure from fine mist to a heavy spray. If you want other options, however, we’ve got some other picks for you below. 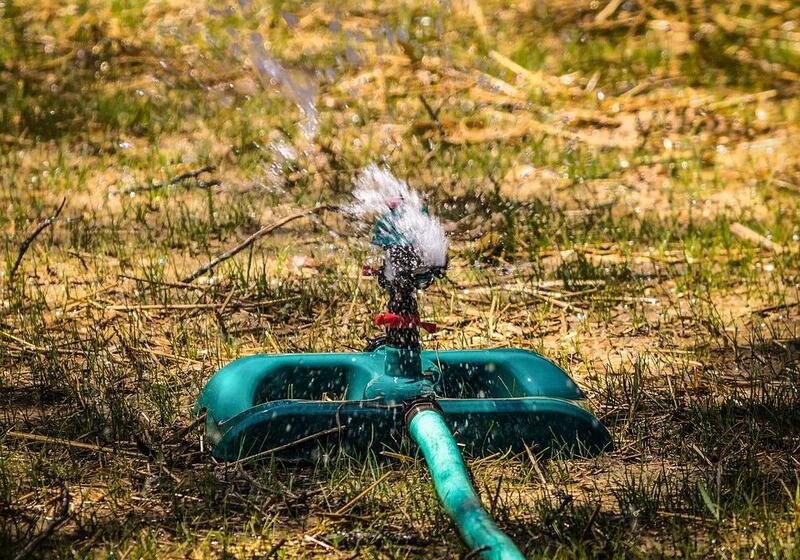 A lawn sprinkler covers more space than a handheld sprayer or garden hose with a traditional nozzle. Sprinklers provide deep watering which soaks the roots of grass, flowers and plants. High-intensity sprinklers (or sprinkler settings) are better suited for medium to large lawns. Drip and mist sprinkler settings are better for delicate flowers and small plants. If you consistently notice puddles after using your sprinkler, your lawn probably has clay soil, which doesn’t absorb water as fast as sandy soil. The type of soil you have determines the length and intensity of irrigation, and to a lesser extent, what sort of sprinkler you should use. Determine your soil type by filling 1/3 of a glass jar with soil, and then add detergent, water and shake the jar. Leave it overnight and the next morning you’ll know if you have clay, sandy or loam soil. (source). There are several types of lawn sprinklers, and certain lawn sprinklers may combine two or more of the elements listed here. An oscillating sprinkler providesÂ a gentle spray good for seedlings and just-planted flowers. These oscillating sprinklers areÂ made of a metal or plastic tube and spray water back and forth in a tick-tock motion, sometimes on a sled base. It’s excellent for watering rectangular lawns and works equally well at low and high water pressure. If you have a curved or irregular lawn, the spray may miss its target. If you have a round or irregular shaped lawn, a pulsating sprinkler, or spinning sprinkler, offers a rotating head capable of watering a small, circular portion if it at one time. It gently waters large areas with a circular spray but makes more noise than most other sprinkler types. The most common sprinkler type, fixed or stationary, saturates small areas. It sprays in one pattern and is best for low-pressure watering needs. Fixed sprinklers offer limited coverage for small lawns, and the watering holes may get clogged. If left in one area for too long, these sprinklers cause a sudden spike in the amount of puddles on your lawn and sidewalk. Impact sprinklers, modeled after an impulse sprinkler, spray single or multiple streams water in an arc. This type of impact sprinkler is designed for large lawns or backyard areas. You often see impact rotary sprinklers in parks or other large public spaces for the coverage area. Avoid using impact sprinklers on flower gardens, as the powerful spray can damage delicate plants. A traveling sprinkler, as opposed to a stationary sprinkler, covers a wide area and works well for triangular or other odd-shaped yards, hilly terrain, and the long strips of grass at the sides of your house. It offers multiple sprinkling patterns to accommodate these different areas, it could be called a spray pattern master. Rotary sprinklers have a base unit consisting of two or three arms with water jets at the end. Some rotor models offer adjustable jets and bases for better spray coverage. Rotating sprinklers are best used on medium sized lawns and landscapes, rotary sprinklers usually emit one inch of water per hour. An automatic timer lets you choose when you want to turn the sprinkler on or shutoff the sprinkler to prevent accidental soil saturation. A flow timer customizes the amount of water emitted, so you can calibrate it to different settings for different parts of your lawn, while an automatic shutoff valve shuts down a sprinkler once it has finished its preset pattern. Look for these features to help monitor your lawn sprinkler use and ensure more even watering. These sprinkler systems require help from a professional or a DIY project, but they’re worth mentioning in case your garden or lawn layout requires specialized irrigation. In-ground sprinklers provides watering forÂ large front and back yards and landscaping These sprinkler systems are programmable by zone, and usually include a built-in automatic timer. In-ground systems An irrigation specialist must install an in-ground system. A drip irrigation system is similar to an in-ground sprinkler system, but it’s designed to keep roots moist instead of saturated. Pop-up sprinklers may be used, along with irrigation tubing, to water vegetable gardens and other vegetation. A low-pressure system emits less water than in-ground and most above ground sprinklers. If you’re not sure what sprinkler type will fit your size yard, check out this video from the YardSmith YouTube Channel for pointers. Hydrate lawn with one-inch water per week. For best results, water twice a week with half an inch of water each time. Place your sprinkler in an open area away from trees and buildings to ensure all water reaches only its intended area. Water long enough to penetrate the grass roots. Your lawn’s root system is located in soil six inches below the lawn surface. Check soil moisture every 15 minutes using a small shovel to make sure the roots are thoroughly soaked. When temperatures are above 90Âº, spritz your lawn for 5 to 10 minutes per zone in the afternoon to prevent dry patches. Use a rain gauge to measure your sprinkler output. After running your sprinkler for 30 minutes, measure the water depth and multiply by two to determine the sprinkler’s water output for one hour. Adjust the irrigation time if you find you’re over or under watering. The Toveli Premium Lawn Sprinkler combines several features to benefit most yards and gardens, regardless of size, soil type or vegetation. The adjustment collar, which allows you to tailor everything from spray distance to pressure (a mist for a flowerbed vs. a full stream for a large lawn), makes this a versatile sprinkler for most yard work needs. The ability to customize water amount and pressure helps you conserve water and contribute to a more sustainable environment. You’ll also stop saturating or under-watering key areas. With a spray scope that rotates from 0Âº to 340Âº and reaches up to 86 feet in diameter, most people will find they can use this sprinkler anywhere on their property to soak or mist any plant. The rotation and distance are easily adjustable without needing to change water flow. Despite its high-end features, this premium sprinkler is affordable and safe enough to be used during the summer as a cooling shower for kids and dogs. Other brands to consider are Gardena Zoommax, Raintrain, Sweethome, Rainbird, and Aquazoom, which can be found on Amazon or at Home Depot.